NWU-1 - Current working uniform of the US Navy. 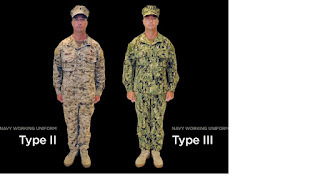 The Navy has announced yet another working uniform (Navy Working Uniform 3, or NWU-3). 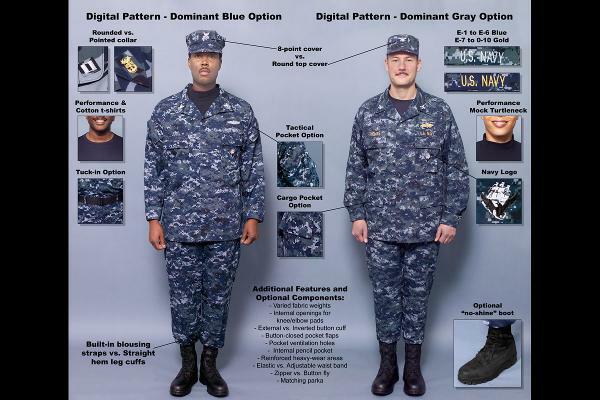 Before I get to that, let's review the Navy's current working uniform for those of you who may not be up to speed. 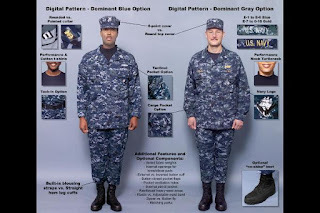 The navy transitioned from its traditional working uniforms, wash khakis for officers, warrants and chiefs and dungarees for other enlisted, to a blue camouflage scheme. Cynics suggested that the only value in camouflage blue was in the event you were washed off the ship at sea and there were claims that they couldn't find you when they looked because you were effectively camouflaged. WHY DOES A NAVY NEED a camouflaged working uniform for on ship in port? What possible value is 'blue camouflage'? My sense was that somebody really high up was smoking something that the navy prohibited, but who am I to judge - an old salt who harkens back to the simpler days. Are the Americans trying to keep up with Chinese fashions? 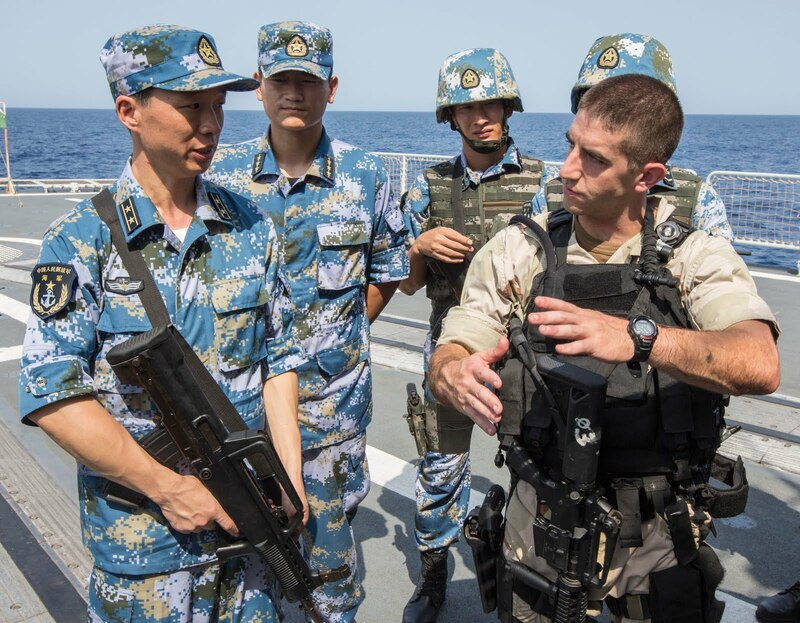 In the photo (right), you will see members of the People's Liberation Army's Navy in their blue camo, standing next to an American naval officer. 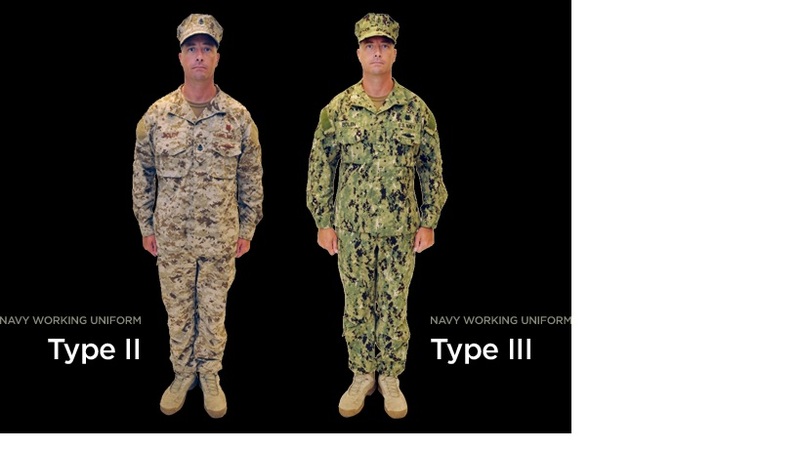 Since the US Navy is now adopting a green woodland camouflage working uniform for service aboard ships (yeah, crazy, right? ), for the sake of economy shouldn't they adopt the same camouflage uniform used by the United States Marine Corps (MARPAT, or Marine Pattern)? 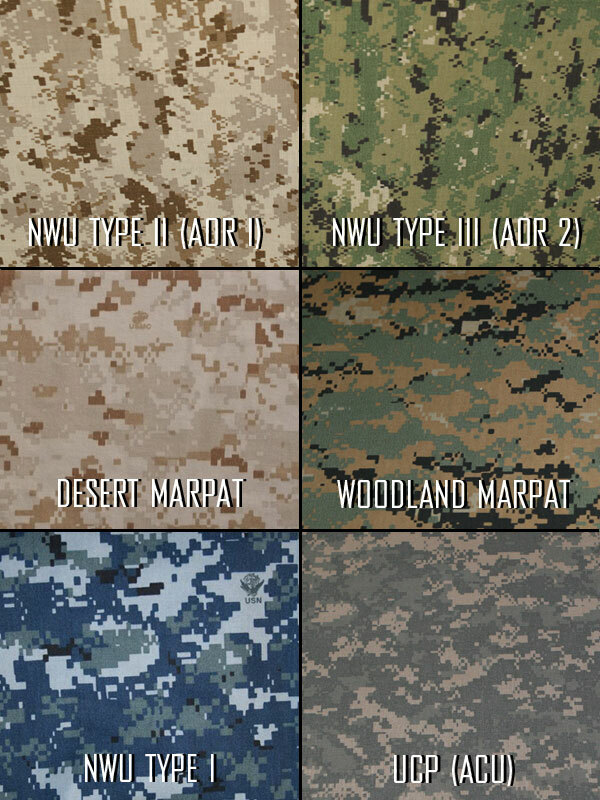 Uh, no, it will be a DIFFERENT green (NWU-3) woodland camouflage uniform or brown/tan camouflage uniform (NWU-2) than the one worn by Marines (Naval light infantry). If you're asking yourself whether or not the Navy has gone insane, the question is well founded. I suspect that in four or five years, when another admiral is in charge of uniforms, you'll see yet another change. For now, when you see somebody wearing one of the two uniforms (right), they're not soldiers, marines or airmen, they are the US Navy. Does the Navy feel that the camo will hide the sailors on ships from enemy detection? Somebody mentioned the SEALs, and their need for new Navy uniforms. Just a word of practical advice. The SEALs wear any sort of uniform that they want to. During Gulf War 1 (Desert Storm), we wore Marine Corps uniforms without the name and service strips over the pockets because they were available and the issue of the old desert popcorn style uniforms was slow in coming to the theater. It mystified the Marines particularly because nobody wore rank or saluted, said "hi" and used first names --- but the Navy didn't care. SEALs decide what works best for the circumstances and wear that. Will they wear the new uniforms? Sure, sometimes. The uniform of the day on base is swimmer shorts, a blue an gold swimmer shirt and sandals, and nobody salutes, but they do say "hi" and use your first name. Does flying an early national flag fall under the First Amendment's right to free speech? These days many people say, that it does not. 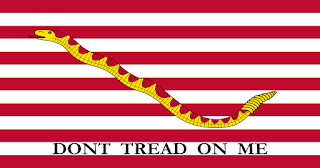 Should you buy and fly the Gadsen Flag? (Fox News) The answer may be "no". 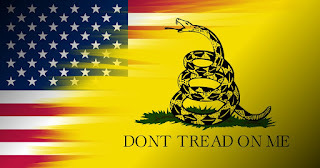 If you Google "Gadsen Flag" you will see a lot of prog images that deface the Gadsen Flag. Apparently the flag offends delicate people who want to see the Constitution replaced with a "living document" that can change with a whim. Clearly there are US politicians who would like to change the law (only as it applies to them) every time it's useful to do so. Some prominent Afro-Americans believe that the Gadsen Flag symbolizes enslavement of negroes and the news reference above suggests that if you fly the flag or wear something that conveys the message, you are a racist. I will go so far as to suggest that in the modern context, displaying the flag may also mean that you're Islamophobic, homophobic and maybe even ophidiophobic. Editor's Note: There is also a fictional phobia to describe the very specific fear of being chased around a table by timber wolves on a freshly waxed floor while wearing socks – it is called Luposlipaphobia. People who suffer from this fear are advised to leave this blog seek their safe space immediately. 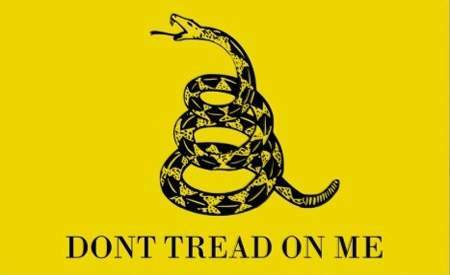 Will it ever become tacitly illegal to fly the Gadsen Flag in America? My sense is that it may. Clearly there are people who are disturbed by history behind the flag. It was flown by patriots in the Revolutionary War that freed America from Britain - so the Brits should hate the flag, but apparently these days they don't. It's not the British, who have the most cause to object, who are angry and crowing. 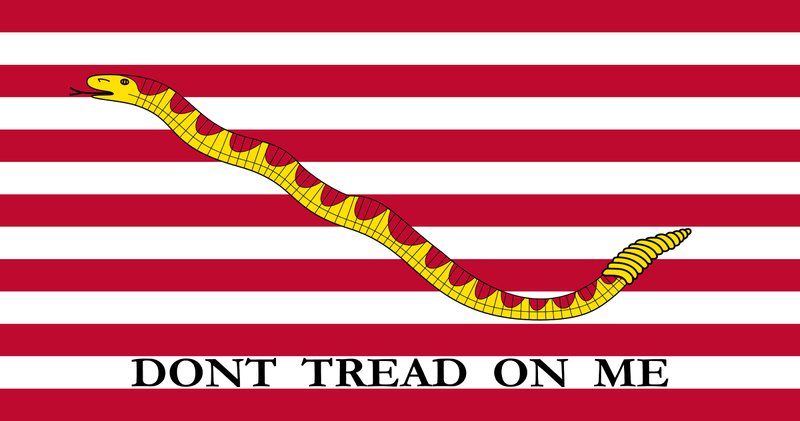 The US Navy adopted their version of the Gadsen Flag as the first Navy Jack. In 2001 after the terrorist (or workplace violence) attack on the World Trade Center, the Navy began to fly the flag on the jackstaff of warships once again. That practice ended when Barack became president and the War on Terror shifted to become a "Foreign Contingency Operation". Yes, it's clearly Islamophobic. There is precedent for suppressing this sort of thing. If you recall the IRS Targeting Scandal, the President of the United States directed the Internal Revenue Service to target organizations with "Liberty, Patriot, Freedom", etc. as part of their name. Anyone who advocates Freedom is clearly a racist. The same could be said of somebody who thinks that liberty is important. Those same people are likely Islamophobic as well. Since the US Tax Code is 78,608 pages long, a canny IRS agent can find SOMETHING that everyone is doing wrong. 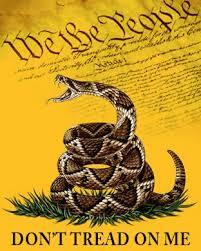 It becomes the ideal vehicle to use to suppress people who may not agree with the president's "progressive" agenda. Many Afro-Americans feel that since some members of the Tea Party flew the Gadsen Flag at its rallies, and many Tea Party members were white, the flag is inherently racist. Is there still that phone number at the White House where we can call up and denounce people who are politically incorrect or "fishy" as Barack termed it? Are progs ichthyophobic? When Barack first announced that program, I called the number and ratted out California Senators Feinstein and Boxer but never received the promised payment or tax-exempt status. Frustrated, I denounced film maker Michael Moore as a person harboring secrets. Still no cash payment from the Obamanation.